On November 11, 1960 construction began on the Chemistry-Physics building. 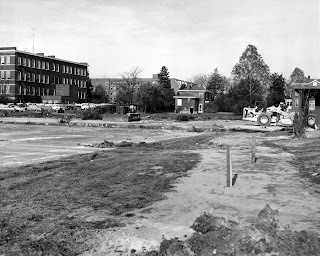 The current site of the building once was occupied the by President’s garden and tennis courts. Physics once occupied 33,600 square feet of Pence Hall and Chemistry 41,500 in Kastle Hall and an addition 3,600 square feet in an old wooden barracks. The new Chemistry-Physics building provided three times the space for the two departments. The building was also outfitted for numerous special research facilities. 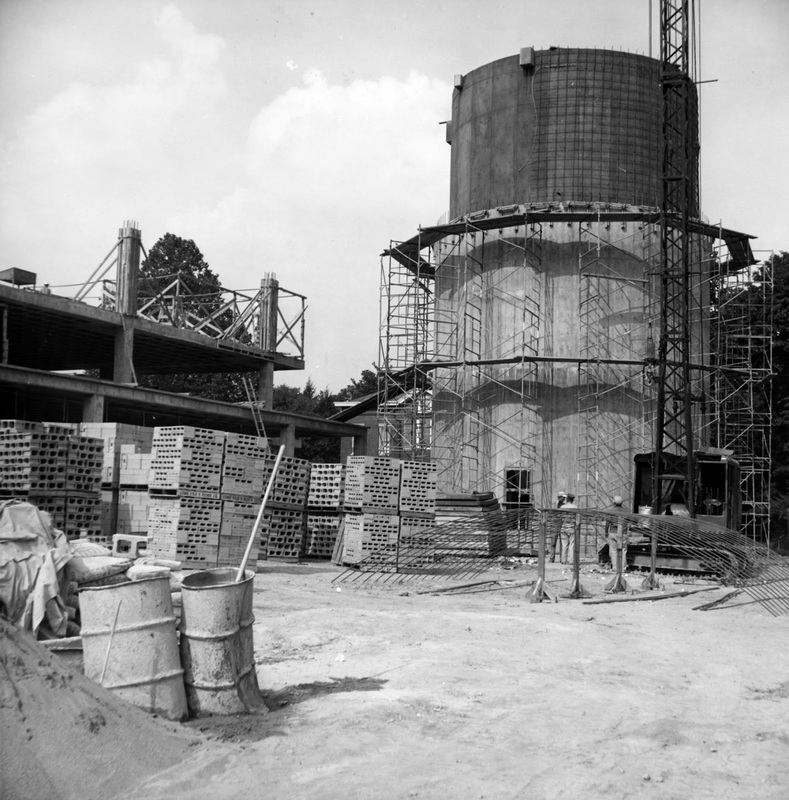 The silo at the northeast corner of the building was designed to house a 5.5 million volt Van de Graff electrostatic nuclear accelerator. It has an internal diameter of 30 feet, it rises 58 feet above the ground and extends below ground for 13 feet. The concrete walls are two feet thick and two underground laboratories are connected to the silo. 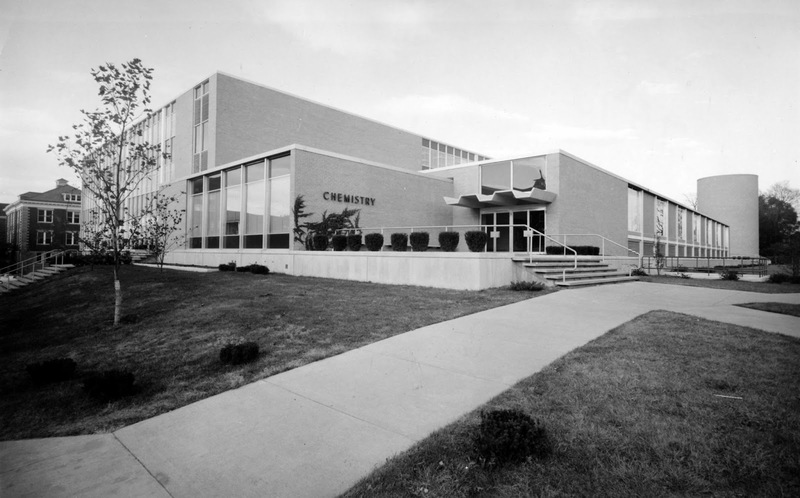 The Chemistry-Physics building was completed in April 1963 at a total cost of $6,084,076. It has four floors and a basement for a total of 244,000 square feet. The facilities were built for Physics to have: two lecture halls with 200 seats each; eight classrooms with 40 seats each; 20 faculty offices; 7 faculty office/laboratories; and labs for graduate and professional research. For Chemistry to have: a 270 seat lecture room; 200 seat seminar room; 3 smaller lecture rooms with 150 seats each; 9 classrooms with 49 seats each; 15 instructional labs accommodating 48 students each; 12 faculty offices; and 15 faculty office/laboratories. The total space accommodated 4,800 students. The central library was built to house 50,000 volumes with 90 seats. 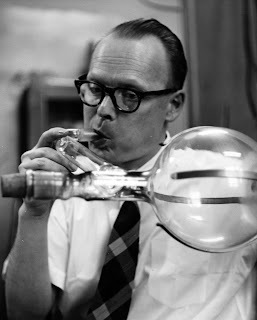 Housing physics and chemistry together was meant to assure greater capabilities for both departments at a time when it was becoming clear that the basic sciences were interdependent. When the building was opened the Chemistry department employed a full-time glassblower while the Physics department had an instrument shop under supervision of a machinist and each was able to draw upon the resources of the other.